1. Cut tails off of jalapenos, place jalapenos in sauce pan then add water. Bring to a boil; boil rapidly for 10-12 min. Remove from heat; place aside. 2. Meanwhile, cut stem part off of cilantro, then measure and place aside. Cut onion and garlic into quarters. 3. 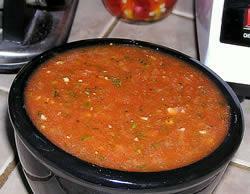 Add in blender; tomato sauce, water, onion, cilantro, garlic, salt, oregano and jalapenos; cover. Blend for 30 seconds. 4. ENJOY! Serve with chips, also great for tacos, burritos and for you salsa lovers, almost everything!